DaveSigaty: I just encountered the following variation in a game on IGS. I was White. I had just been (re)reading one of my books by Otake mentioning how cross hoshi is a fighting approach so I answered with . Ah-hah! It looks like I was right. We start to head for the main line. 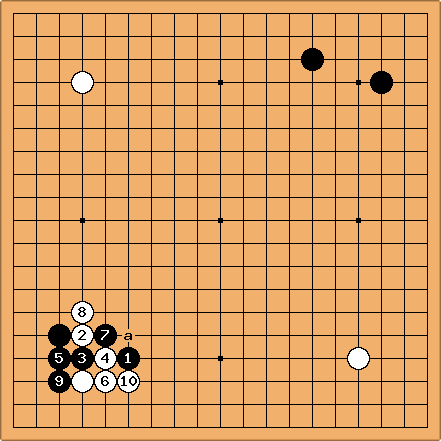 White can not play at since the black enclosure in the upper right breaks the ladder. That is OK though, since as discussed in BQM13 the strategic idea of the main line works best if Black has support in the upper left - which is not the case here. W* at a would be an unworthy compromise on White's part since I had decided I should have nothing to fear. So does Black not actually understand the strategic ideas or does he have something special to pull? As soon as hit the screen, followed immediately. Hmmm, a prepared line? I know two things about this : (1) I have never seen it played this early before, but (2) a kikashi at is a common idea when Black starts with a direct play such as a against the two upper white stones. I actually played as shown below. But what should White play here? I answered with , thinking that Black has some potential problems with shortage of liberties in this situation. In particular, I thought that if Black cut at a with , White could play at here, and answer Black b with White c. After that I do not think that Black has time to rescue the stone at a. Black played instead of cutting and White replied with , keeping the heat on Black's liberties (if now Black a, White c seems to put Black on the spot). Black blinked first by playing but this was a mistake (in my opinion) and I was very happy to play . What could Black have done better? Although the game went well for White, could White have done even better? dnerra: Difficult sequence. My first thought is that in the last diagram is bad - it does not offer sufficient help to the black stones below. I have added an alternative below. 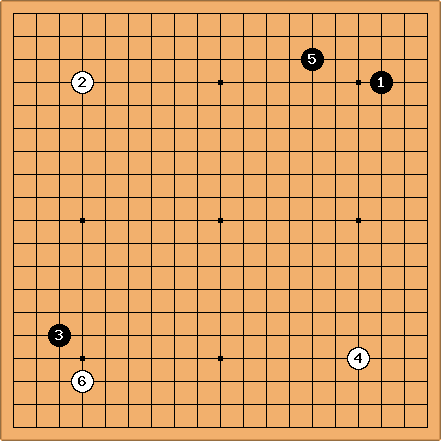 DieterVerhofstadt: My first reaction is that, although Black threatens to capture the two stones on a large scale, leaves too many cutting points and should therefore be a connection at (diagram below) or even better, a. 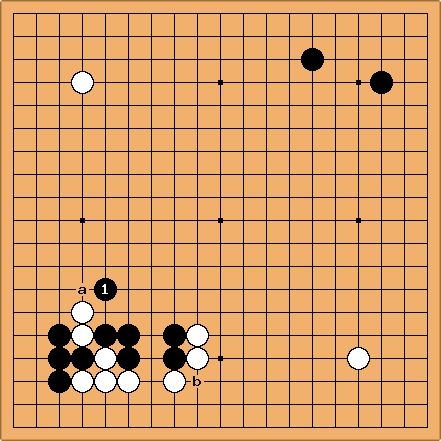 White is then very strong, has influence towards the bottom right and makes territory. Black however has still a lot of aji to resolve along the left side. Now it is White suffering from aji. What if Black next cuts at ? ? DaveSigaty: I expected to answer with here which Black must answer, or lose the two stones. In fact it is difficult to find a reasonable reply for Black so I think the cut really isn't possible without some preparation. HolIgor: It is a variation on the crane's nest. DaveSigaty: So Black can not cut at in Dieter's diagram (b in mine). Rather he has to back-track and protect his stones somehow. In that case is White better off having a stone at in my diagram (in which case I think White has to continue with c) or at in Dieter's (which leaves less aji in the black cutting stone but puts less pressure on the black stones above)? I don't really know which is better; I didn't consider descending at in Dieter's diagram during the game. ...Black gets two stones and sente. 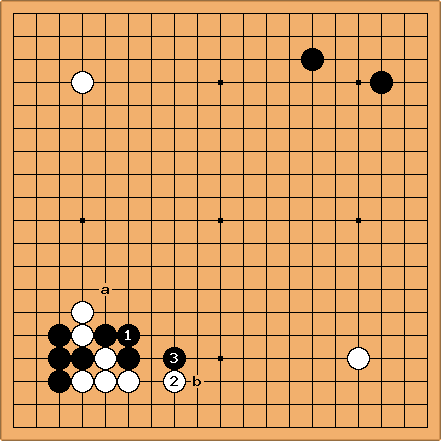 However, White gets nice influence as well, and the two stones still have aji, so I don't think White has any complaints here.